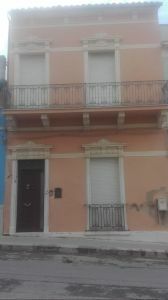 In the historic center of Vittoria, a few steps from the Church of San Francesco, the municipal villa, the Calvary and the Emaia Fair, in a quiet area of the city there is an independent property on two levels and attic with garden, well distributed and bright . The living room, kitchen, dining room, bathroom and garden are located on the ground floor. On the first floor there are two large bedrooms with verandas and balconies, a small room and a bathroom. Climate control, with double glazed external frames. Possibility to rent only part of the property. Only referenced!